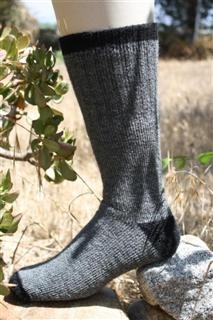 The OutdoorAdventure socks are fitted in the middle and upper with reinforced heals and toes. They fit calf high or knee-hi with a comfortable yet not restrictive fit. Perfect alpaca solution to cold weather active fun. Our socks are a blend of excellent quality alpaca (50%), nylon and acrylic to offer the best of warmth, durability, wash-ability and comfort. Why not more alpaca? More than 50% alpaca will tend to make the socks not only significantly more expensive, it makes them a little less wear resistant. Years of testing have resulted in the Choice Alpaca blend that feels great, machine washes and lasts over time. We have been selling alpaca products since 2002 and learned that a super warm, soft, strong, comfortable and MACHINE WASHABLE alpaca sock has been the most frequent customer requested item. Our socks are a blend of excellent quality alpaca (50%), nylon and acrylic to offer the best of warmth, durability, wash-ability and comfort. Why not more alpaca? Frankly, our tests show that alpaca is so powerful that only about 30% is needed for the warmth and softness we seek. More than 50% alpaca will tend to make the socks not only significantly more expensive, it makes them a little less wear resistant. Years of testing have resulted in the Choice Alpaca blend that feels great, machine washes and lasts over time. Have you asked, "What are the warmest socks ever?" These are it! Not only are they warmer than any other sock, they're COMFORTABLE, DURABLE, WASHABLE and made from....ALPACA! 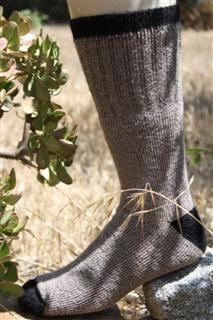 Made from alpaca wool, these extremely warm alpaca socks are surprisingly soft and comfortable. These alpaca socks are designed to last and last. Perhaps best of all, unlike most other heavy wool socks or alpaca socks, they were created to be Machine Washable/Dryable! 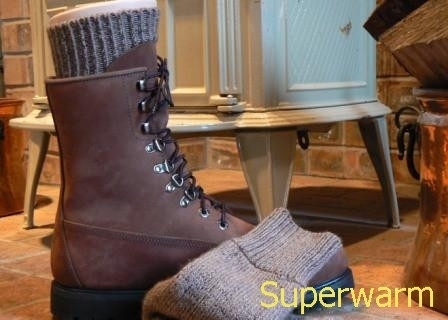 Attention Motorcyclists: Our Superwarm Alpaca Socks are IDEAL for cold weather motorcycle riding! Soft, thick and warm, you'll feel great over long cold riding days with these socks in your boots. Forget the fake stuff, use natural alpaca to stay toasty warm!